As with other concrete projects, one of the benefits of concrete floors is the ability to achieve a look that is one of a kind. 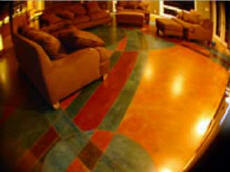 Concrete contractors have their own proprietary materials and coloring methods. In addition, many concrete specialists take full advantage of their creative and artistic talents to produce floors that are spectacular, almost unimaginable. One such project is the La Honda House, designed and created by David Pettigrew of Diamond D Company. Pettigrew was basically given free reign to design the floors in the 6,000-square-foot California house. The kitchen is graced with beautiful mahogany-colored concrete countertops. The kitchen floor resembles a stunning piece of artwork, resplendent in rich hues of amber, gold, and sage thoughtfully arranged in interesting, interlocking shapes. A swath of the brown color matching the countertops accentuates the floor design. In the dining room, a redwood-colored, picnic-style table sits atop an amber-colored floor, accented with dark-colored diamonds, almost resembling a checkerboard. In the living room, patches of a sea-colored blue-green one of the most difficult colors to achieve in concrete intersect with varied shapes of earth tones. 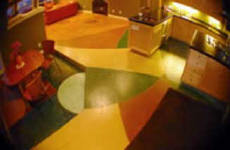 A game room floor comes to life as large circles of blue-green intersperse with a rich, dark red and a burst of yellow flashing across the room. Concrete runs throughout the house in the floor of the guestroom, in a back bedroom, in a shower surround, on the countertop of the master bedroom, and in the master bath and shower. "Everyone who comes in the house can't believe it's concrete."